I had to make some decisions on how I wanted to proceed with this challenge these last couple of weeks. I think that I have done a decent job showing that it is possible to eat well on $1 a day and I've created a pretty decent cushion between the goal of eating on $1 a day and what I have actually spent. So the question I had to decide was whether I should see how much I could actually save and limit my purchases only when there are great deals, or splurge a little as a reward for all the savings I have done up to this point. I would like to think that I thought long and hard about this considering both the pros and cons of each side, but that would be a lie. It took me literally 1 second to decide and thinking back on it, I probably spent much longer thinking about it than I should have. The goal is $1 a day and as long as I stay under it, all is fair game. It's time to splurge a little. The problem, of course, is that when you have been doing this for 80 days, it gets difficult to splurge even when you know you can. I am at the point where I buy some of the stuff I want at full price and would still be fine, but I just can't do it. So I had to look around for deals that I could justify splurging on a bit. All together I spent $4.75 for the above items. Now that I have decided to splurge a bit, I'm curious what all of you would splurge on if you had $10 to spend on anything? I ended up having a bowl of the Apple Cinnamon Cheerios later in the morning. I've had the gallon of milk for quite awhile now and I am afraid that it is going to go bad soon, so I need to finish it up in the next couple of days. In the afternoon I had errands to run so I made myself my standard peanut butter & banana sandwich, celery & carrot sticks with cream cheese and ate my last granola bar. The Beginning ::: Day 84: Free Cheese! I don’t know how things work in the states, but here in Denmark, the best way to get lots of fresh cheap strawberries is to bike out to a farm and pick them yourselves directly from the field, if you don’t have containers they can usually provide and you pay by the kilo. Bring the kids and the whole family and afterwards be sure to make a picnic out of it. The best way to eat strawberries (other than raw) is to half them or slice them, put them in a bowl, add sugar to taste and let them sit a bit (5-20minutes) and add milk, half and half or cream (I usually mix milk and cream into something that probably have 10-15% fat) and enjoy! Bacon is definitely a worthy splurge. My favorite grocery splurge (on a budget of 200 a month for four) is good cheese. Excellent splurges!! I would splurge on some fresh herbs, basil is my favorite, and grated Parmesan cheese. We just made a fantastic summer spaghetti “alla carbonara” this week from “Cooking For The Weekend”. I’ll cut the recipe down to 2 servings for you. 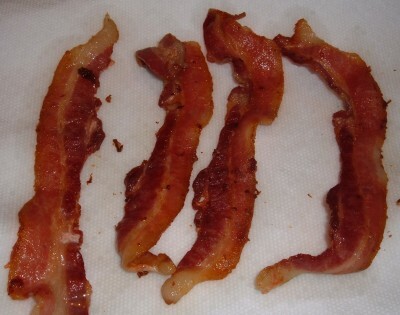 Cook diced bacon until crispy, drain on paper towel. Cook spaghetti according to package directions in salted water. In a bowl, whisk the egg and Parmesan together. Stir in the tomatoes, basil and corn. Drain spaghetti, return to pan and add egg/veggie mixture. Toss everything together, the heat from the pasta should cook the egg enough. If it seems too runny, turn the heat on for a few minutes. Top each serving with crispy bacon and black pepper. 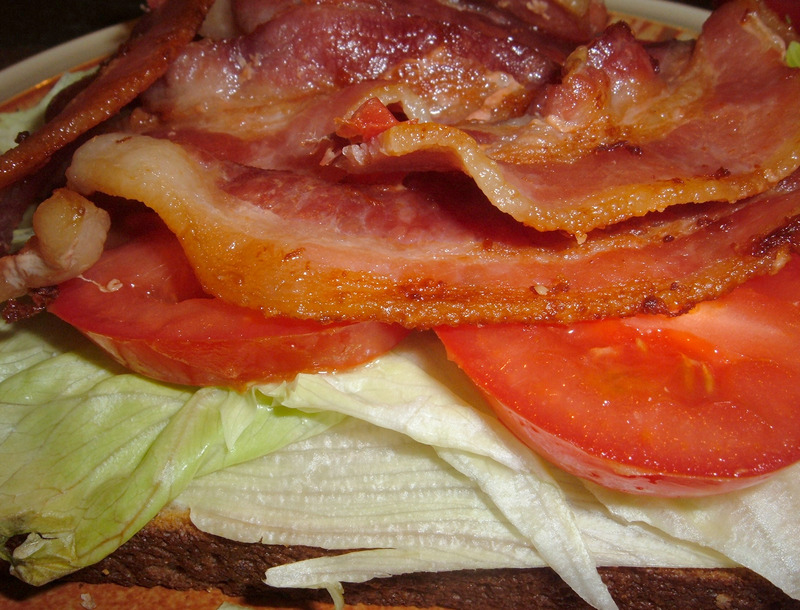 mmmmmm…BLT sandwiches. 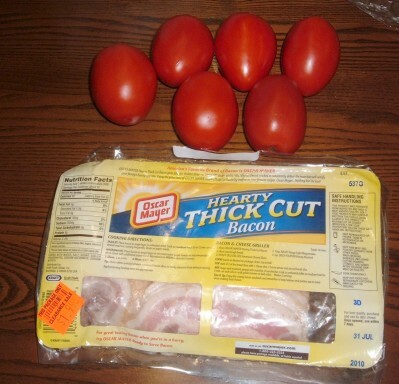 I think I will go get a package of bacon out of my freezer and have BLT’s for supper tonight. I have an abundance of tomatoes from the garden so only need to get some fresh bread and lettuce today. I have to go buy some farm and business supplies and thought I would stop by the grocery store and scope it out for blinkies, catalinas, and what not. Maybe I will even accidentally get some good deals on the few things I need to buy there. Time to make yogurt? That would use up milk in a hurry and preserve it for later use in the form of fermented goodness. If the bacon was discounted because it was at the sell by date it would be best to either freeze it (in small portions) or cook it all up and then refrigerate it for later use. It won’t keep long raw if it is really old. Splurge for me would be a nice brick of Parmesan cheese. You can make so many things taste great with a bit of cheese. Good olive oil and real butter would be something else I’d have to buy. I can’t cook without these. With the purchase of a couple of inexpensive items — tomato soup and ground chuck — you seem to have the ingredients for making some delicious Stuffed Peppers. I don’t have a special recipe, but the recipe should be easy to find. I know what you mean about finding it difficult to splurge now. Recently I had a $25 coupon I needed to use from a special promotion I participated in. I wanted to make good use of it and not blow it. Surprisingly It was difficult for me to get to that $ figure. I was discussing this with 2 co-workers. One was of the mindset that she would have gone to the store and bought special things that she might not get otherwise..the other co-worker was like me. Spend wisely and get the most I could for the money. While I could understand the concept of free “money” to blow..I just couldn’t do it! Bacon was an excellent choice. After reading others’ suggestions, I would second the olive oil suggestion (we buy Trader Joe’s extra virgin, best price around) and other flavor additions – things like cinnamon (though I think you have some already), Italian seasoning blend, turmeric, spicy mustard, black pepper, hot sauce, and garlic salt. (Heck, almost anything is a little better with olive oil and garlic salt – okay, maybe not your morning smoothie …) And after so many weeks of soda abstinence, I would want an ice cold Diet Coke. I would probably buy butter, to make myself cookies. But cheese and olive oil also sound like good options. The discounted peppers/fruit look fresh – good deal. 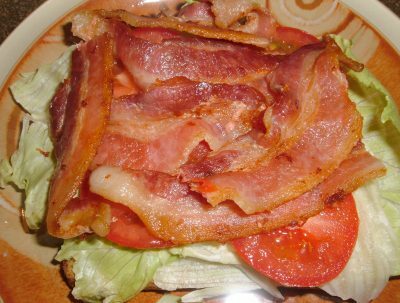 It’s good that you have a “regular” meal of BLT. Thank you, Jeffrey, for your suggestions. I have had some measure of success today but, some disappointment as well. I shop Ralphs which is the southern California division of Kroger. (Certainly not a small operation.) After much scrutinizing in the store and through their flyers I’ve come to be certain that they do NOT advertise catalinas at all though they advertise their Mega event sales (typically buy 10 participating items get $5.00). I did however get two of them, one by sheer luck and the other after researching at HotCoupon World (that hint might help some other readers with this same problem). Otherwise I wouldn’t even know about them. Another problem that I have had is that the eCoupons are not reliable. I’ve had a couple fail already and at least one was for something I had no paper coupon for so that couldn’t have been the issue. 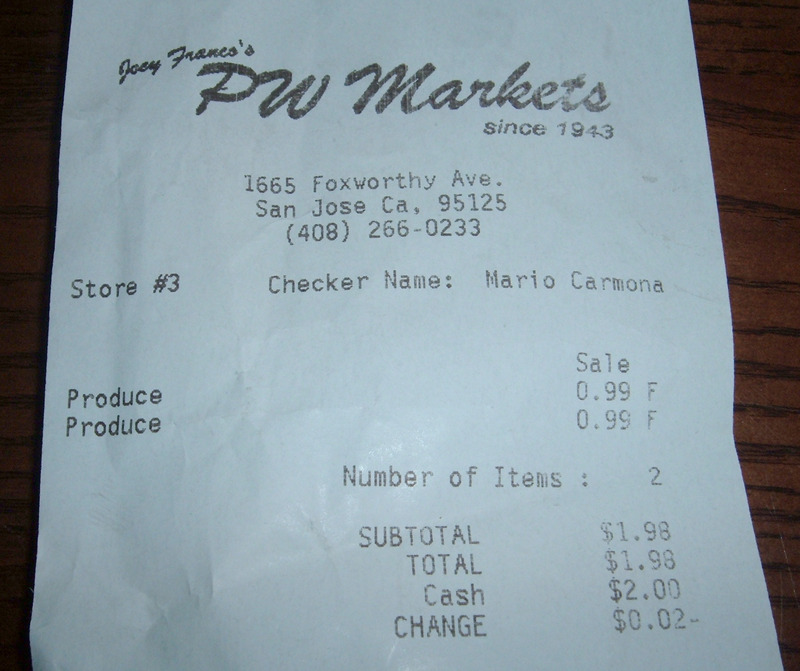 It doesn’t seem to matter if they are loaded onto my shopper’s card through the store site or from Shortcuts. I’ve sent Ralph’s an e-mail as I was a little annoyed. Again thank you and I see that you’ve gotten some pretty good recipes to use with your purchases. Seafood hands down! Love me some shrimps, and baking goods to make some homemade cookies or pizza. Something to consider for the next time you buy milk: it freezes great. Use plastic bottles, of course, and don’t fill them all the way. Actually, since you’re cooking for one, I’d freeze the milk in one cup portions using 12-16-20 soft drink bottles. That way you can defrost only what you need at the moment. After thawing give the bottle a good shake before using. Oops. That was supposed to be 12-16-20 OUNCE SIZED bottles, not that many bottles. Hmm. 2 cups to the pint, 2 pints to the quart, 4 quarts to the gallon…(Do I have that right?) so you could pour a cup each into a dozen bottles and just have 4 cups to consume before it starts to turn on you. Ice cream. No question. And since I would still have a few bucks, strawberries and chocolate covered, caramel dipped marshmallows. Yum. I may just do that today. Also, do they have any produce co-ops where you are? I just tried one this week, and for $15 (a lot for this challenge I know) I have literally enough produce for my family to eat fruit and veggies every day for a whole month. 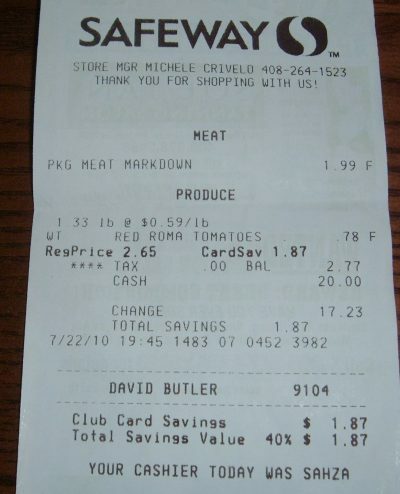 If you could split something like this with someone every other week, I think it would be a great way to save some cash on fresh produce. You can freeze milk, although it takes a few days to thaw, and you have to stir it up because it separates. Once I bought a gallon of milk and found that it was about to turn. I called the store right away and they said to toss it and come get a new one. Well, I certainly wasn’t going to pour it down the drain, so I made clam chowder, chocolate pudding, and did some baking with it. I think you could “splurge” for a chocolate pudding mix and use some of your milk. I love your blog. I’ve been following it for about a week. It took me three days to catch up, but I’m checking daily now! There’s nothing wrong with splurging on a little bacon. Actually, your only true “splurge” was loading a bunch of it up on one sandwich. After this, ration yourself to using 2 slices of bacon for a few different dishes and you’ll get a lot of flavor for not a lot of money. Fry up the bacon first, then remove it and use the grease to flavor scrambled eggs or hash browns or some vegetables (brussels sprouts are ideal when in season) to toss with some pasta. For example, buy some soy sauce to use in your fried rice dishes, some honey to use to sweeten your smoothies and oatmeal rather than sugary fruit juice, some red wine vinegar and dijon mustard to use to flavor pasta and potato salad, some canned tomatoes (diced and sauce) and make sure you have plenty of salt and pepper (and maybe some red pepper flakes if you like a little heat) and canola oil (olive oil would be ideal but probably too pricey – canola oil is the healthiest of the vegetable oils on the basic grocery store market). Sour cream and yogurt instead of ranch dressing or mayo will also elevate your food quality substantially. $10 to splurge? Guilt free? Craft supplies!!! Yarn, embroidery floss, etc. Some really good tomatoes, a ball of fresh mozarella cheese, fresh basil, and a loaf of fresh Italian bread from the grocery store bakery. The BEST grilled cheese sandwich in the world is: 2 very thick slices of Italian bread, julianned fresh basil leaves, thick blobs of fresh mozzarella, and thin slices of good quality tomato put together in sandwich form and toasted under the broiler long enough to get the cheese all gloopy. You could try making pita pizzas. I normally use pocketless pitas but you could either kind. You can buy a can of tomato paste and mix a tablespoon of paste with a bit of water to turn to a sauce for the pizza and add some dried oregano or basil if you have any (optional). Add some cooked crumbled bacon and the diced peppers. You’ll need to get mozzarella or spinkle some parmesan. I usually bake at 350 degrees until the cheese bubbles. I have an easy, tasty meat macaronni recipe you might want to try. The recipe as is makes a lot of food (4 large portions, or 6 small) but you can either cut it in half, or freeze the leftovers. 1. Cooked the macaronnis in salted water according to directives. When they’re cooked, drain and return to pot. Reserve. 3. Add ground beef and onions to a large skillet. 4. Cook at medium heat until meat has browned, breaking it in small pieces as it goes. Add salt and pepper to taste. 5. Once the meat is cooked through and there’s no pink left, turn off heat. Drain the fat. 6. Add the meat/onion mixture to the macaronni in the pot. Add the two cans of soupe and mix well. I can totally understand having a hard time splurging when you’re used to spending so little. I loved Pam’s comments about finding it hard to not want to get the most things for her $25. I know when I get a free gift card (like from a reward site) I still try to find ways to maximize it’s value by using coupons on clearance items. And actually, by shopping this way, I find that I can often get things that used to be considered splurges. You can freeze milk, if need be. Some of my kids think it alters the flavor too much, some don’t care … so YMMV. Just wanted to add a comment about your bacon. Don’t forget to save the bacon fat after you fry it. It is really good to use in place of oil when frying or sauting any vegetables. A little will go a long ways and add the bacon flavor w/o the bacon. Just put the leftover bacon fat into a glass jar or container and put the top on it and let it stay in the refrigerator. Good to go. My grandparents and great grandparents did this. Added to green beans is really tasty too. continued success. I came across this site which tries to keep a list of catalina deals available but, I’m not sure for which areas. It looks worth looking into. I have a friend who is a vegetarian . . . except for bacon! (That is so funny to me on so many levels!) But I agree — there is nothing better than a BLT! Great splurge!! I agree with some of the other posters in that I would use the splurge money to build up my pantry. I’d get more spices and some oiles or vinegars, dejon mustard, and soy sauce. 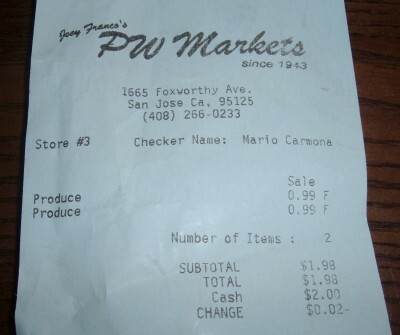 You could also stock up on some other staples like either tomato sauce or even pasta sauce. Oh and some garlic and parmesian cheese. Bacon was the perfect splurge! I love a BLT as a treat once in a while. If it were me, I’d probably spend the rest of the splurge money on some things that will last a while and will allow you to make more flavorful meals – Butter, olive oil, soy sauce, bouillon cubes. I often throw together “fried rice” for dinner: sautee green (preferably) or while chopped onion with a little oil, add in some frozen peas and carrots until defrosted. Then mix in cooked rice, a scrambled egg (cooked on it’s own) and some soy sauce. Yum! I completely agree with Carla — save your bacon grease! It’s great not only for frying vegetables, but also for cooking eggs (including the egg-in-toast meal) and pretty much anything else that could benefit from a splash of bacon flavor. One nice trick for freezing bacon is to first separate the strips and accordion them in a piece of plastic wrap or waxed paper: fold the wrap into bacon-width pleats, putting a strip between each layer of wrap as you go. Wrap the whole accordion stack up to be airtight (or stuff it in a zipper bag), then put it in the freezer. This lets you peel off only as many strips as you need instead of having to thaw/use the whole thing at once, and the frozen strips can go straight into the frying pan. YOu can also cook your bacon and then freeze it. I do that all the time. It works for me because I usually use it with bacon and eggs or in a sandwhich, not as an ingredient in another recipe that needs the flavor of bacon cooked in. I, too, make a mean smoothie. 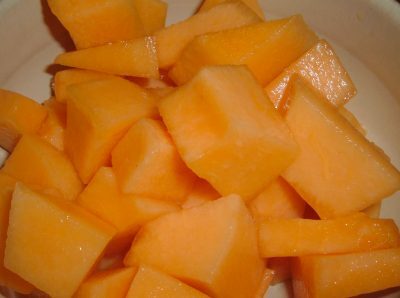 However, I do not like cantaloupe and bf does. He hates bananas. So, I get the banana-strawberry smoothie and he gets a cantaloupe-strawberry smoothie. He tells me it is delicious. My smoothie consists of sour cream and a dash of oj. 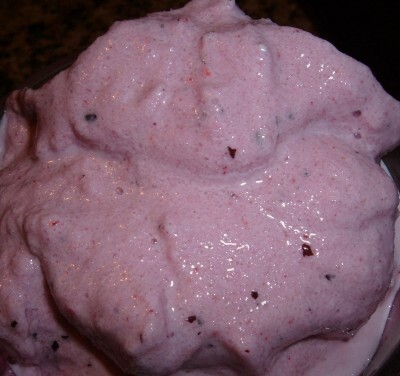 Fruits I add are frozen mango, frozen strawberry,frozen banana, and frozen blueberries. I have no need for ice! 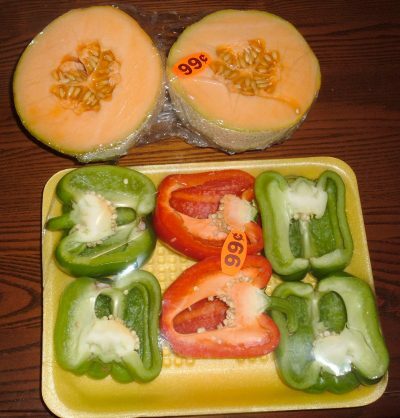 You can freeze strawberries or cantaloupe if you think they will go bad before you use them. Quick freeze on a plate or cookie sheet before you drop the individual pieces into a freezer bag. This works for any of your fruit. Now for a new spin on your old favorite… try a peanut butter, banana and bacon sandwich on toasted (or grilled) whole wheat bread. Trust me on this one… it. is. delicious!